The place of origin of the Psilocybe Thai is Koh Samui, Thailand. It was discovered by enthomycologist John Allen outside the city of Hua Thanon. This magic mushroom has shorter fruit than other cubensis, but with a large cap and long and very meaty stems. It is considered to be the best party mushroom. In Thailand, a monthly Full Moon Festival is organised to honour their sacred mushrooms. 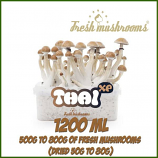 Fast growing, abundant harvest, intense visual effects and a relaxed feeling make this mushroom extremely popular. It is also an excellent species for beginners. 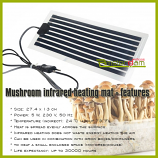 If you would like to get the right balance and good energy in your life, this is the perfect magic mushroom for you!